It is often said that truth is the first casualty of war. As the public debate rages over penalty rates, it appears the truth is being clouded by misinformation, some of it deliberately spread to stoke public fear. 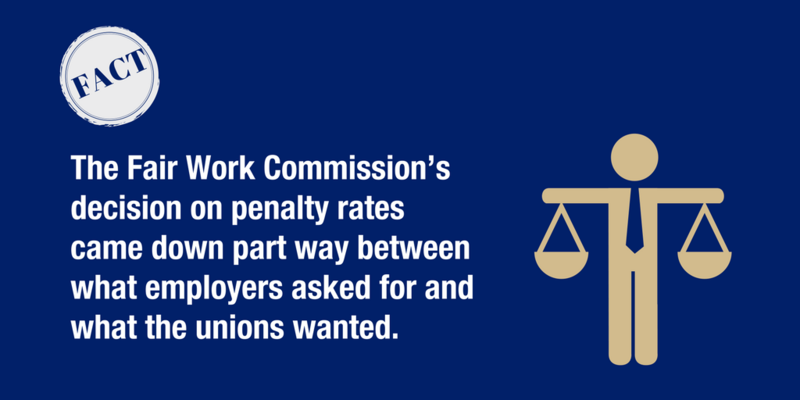 To understand what the Fair Work Commission’s decision on penalty rates really means, it helps to understand some key facts. Put them together and it is clear that the Commission has made a balanced decision that will ease the burden on the shoulders of small business operators, help more people into work, make more work hours available for people who seek them and deliver greater services to customers at times when they want them. Fact: There are 748,000 Australians who are unemployed, including 280,000 young people, and a further 1.09 million people who are underemployed. Reducing penalty rates will make it easier for businesses to give them a chance to work. Many young people get their first job in retail and hospitality, the industry in which 385,000 underemployed people work, but these work opportunities are stifled by excessive penalty rates. 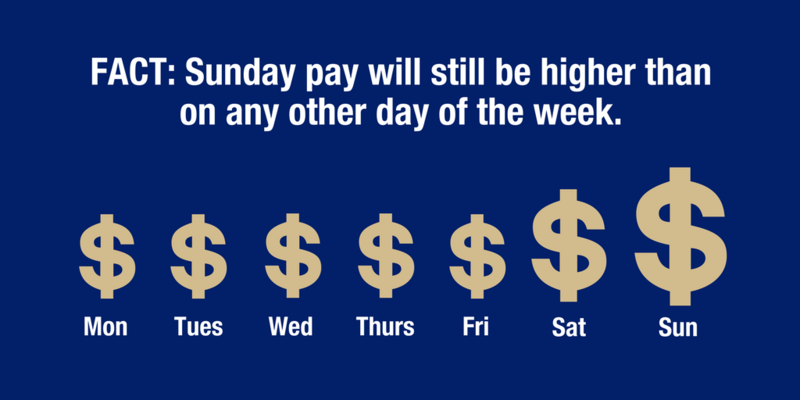 Fact: Sunday pay will still be higher than on any other day of the week. The Fair Work Commission decision respects the special place of Sundays in our lives, and so maintains higher pay than on Saturday, which in turn is higher than on weekdays. This applied before the decision and it will apply after the decision. Full-time and part-time shop assistants, bar attendants and pharmacy assistants will get 150 per cent of base pay on a Sunday, while casuals in those sectors will get 175 per cent. Penalty rates are not being abolished. 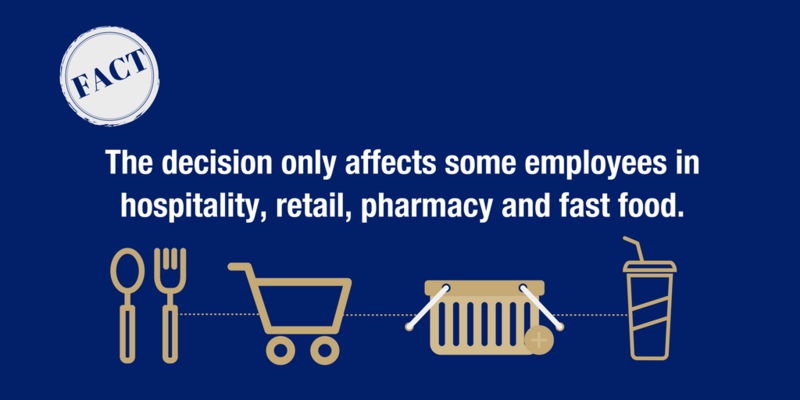 Fact: The decision is limited to workers in hospitality, retail, pharmacy and fast food. Employers in these sectors sought to reduce penalty rates because their customers have a growing expectation of seven-days-a-week service. The Fair Work Commission made clear that the decision does not in any way create a “warrant” for workers in other sectors to have their penalty rates changed. 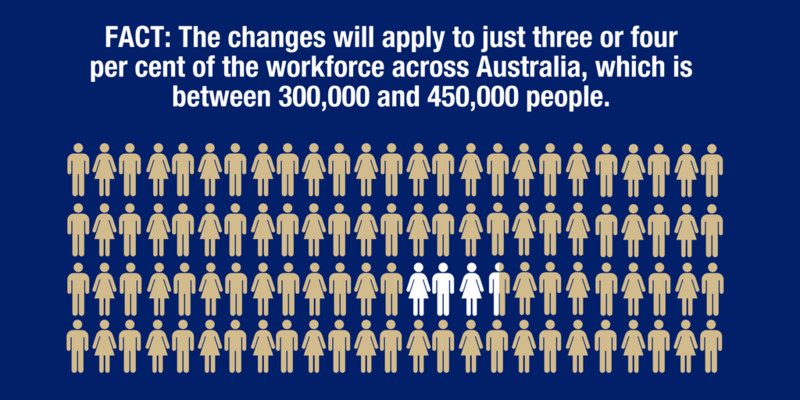 Fact: The changes will apply to just 3 or 4 per cent of the workforce across Australia, which is between 300,000 and 450,000 people. Workers in other sectors or who are not employed under an award are not impacted by the change. Fact: Australia has one of the most generous rates of pay for weekend work of anywhere in the world. Australian retail wage rates are at least 40 per cent higher than other major developed countries, research from Citi recently observed. “It is clear that wage rates are higher and penalties for weekend or overtime work are more significant than NZ, the United States and the United Kingdom,” researchers said. Fact: Workers in jobs that do not require a qualification working on Sundays and public holidays will still earn daily amounts comparable to those in more skilled jobs. 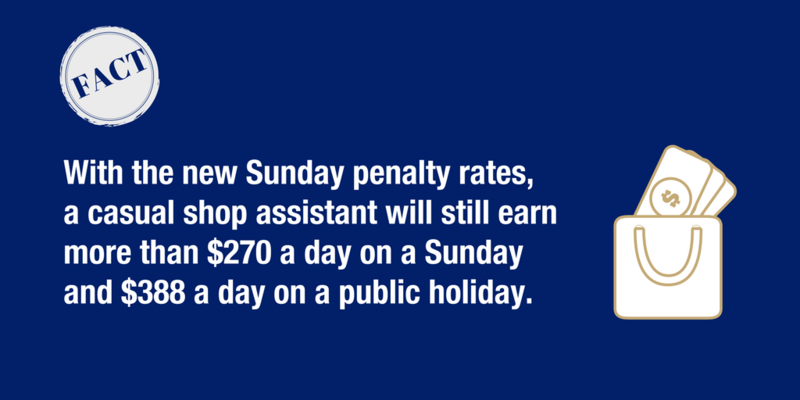 Under the new rates of pay, a casual shop assistant will earn more than $270 a day for an eight-hour shift on a Sunday and $388 on a public holiday. By comparison, a casual relief teacher in Victoria, which requires a formal qualification, earns $293 a day. Fact: Unions have been willing to support reduced Sunday penalty rates in enterprise agreement negotiations with major employers, such as in retail and fast food. It is hypocritical for unions to campaign against changes that will benefit small businesses but be willing to back the same changes for larger businesses. Fact: The Fair Work Commission decision came down part way between the claim made by employers and the status quo sought by unions. After two years of hearings involving detailed evidence from over 140 witnesses, the Commission decided that neither side should get everything they sought. But while employers have accepted the decision, the unions have expressed outrage. Fact: The Fair Work Commission operates at arm’s length from the government of the day in order to take the politics out of its decisions. Just like the Reserve Bank when it sets interest rates and many other independent tribunals, the Commission weighs up the evidence to arrive at a conclusion. Parliament interfering with this decision would undermine the Commission’s longstanding independence, which has been supported by both sides of politics for decades. It is easy to be swayed by slogans and misinformation. When thinking about what the penalty rates decision really means for small business operators, the unemployed and underemployed, customers and local communities, we need to remember the facts. This piece was first published in The Courier-Mail on March 29, 2017.